AMD launched its Epyc processors, which could have a huge impact on its revenues from Enterprise customers, earlier this week. At the same event we heard from several heavyweight server makers who were putting their weight behind AMD. Importantly too, well known IT industry giants are already enthused about AMD Epyc processors and representatives from companies such as Microsoft, Baidu and Samsung gave glowing testimonials. In its 'new era in the data centre' presentation AMD put great emphasis on the capabilities of upcoming "no compromise 1-socket" systems which will be facilitated by Epyc with its more cores, more memory, greater efficiency, and more I/O. Now we have seen one of the first example motherboards that could popularise such servers, from PC enthusiast favourite Gigabyte. 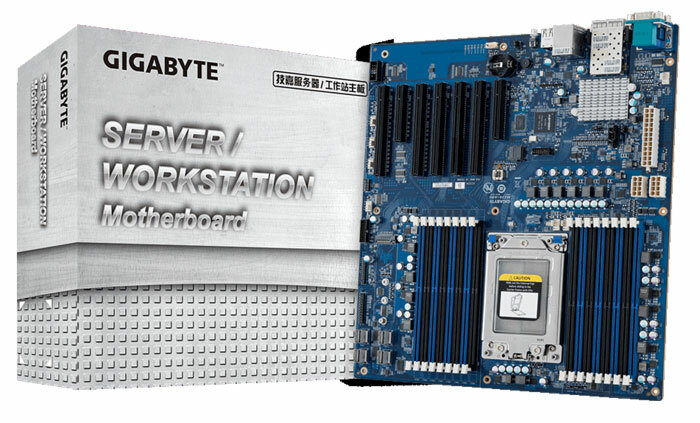 Gigabyte has published the product pages for its new MZ31-AR0 (rev. 1.0) AMD Epyc UP Server Board. 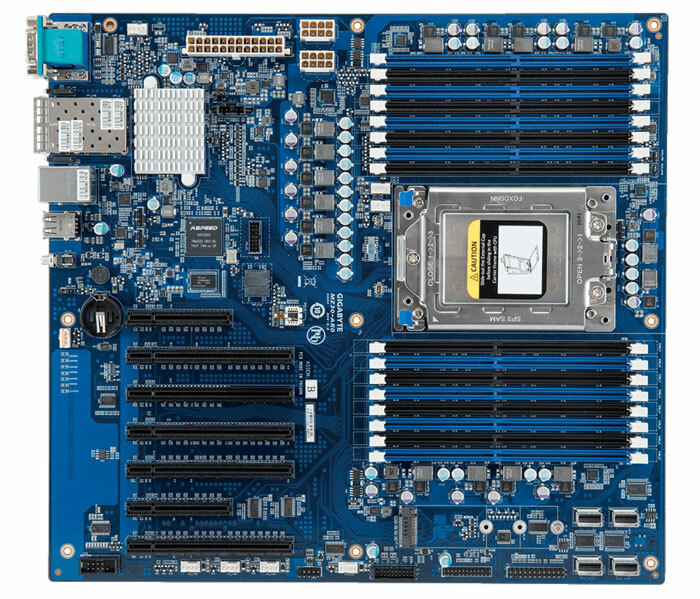 As headlined this motherboard is compatible with AMD Epyc 7000 processor family but should be good for the following two Epyc generations, Rome and Milan, according to AMD. Plus a large set of internal and external I/O connectors. If you do the maths you will quickly be able to calculate that this board can support up to 1TB of RAM, using 64GB LRDIMM/NVDIMMs. Looking at the above pictures hits home how large the AMD SP3 LGA socket is, it looks like a 2.5-inch SSD sat on the board. Notable is the lack of any traditional onboard chipset evident on this motherboard, as AMD has integrated so much functionality into the Epyc 'SoC'. Gigabyte hasn't revealed pricing and availability for the MZ31-AR0. PCIe risers might help there. Most of the servers I've run/maintained have had no expansion cards, or maybe one SCSI card which was no longer than the slot. There's certainly no reason to think that not being able to get very long cards into all of the PCIe slots is a major obstacle to Gigabyte selling these boards - that's only one, relatively small, potential market they're not addressing. Two additional 8 pin power as well as the standard 24 pin for 1 CPU. Requires a fair bit of power then. Power to an upsized socket designed for essentially 4 octacores welded together? Probably to be expected.